With four separate channels, Colorado Public Television sets itself apart with an unparalleled schedule of diverse and independent programming. Take a look below for a profile of each channel. The station’s flagship channel delivers a diverse mix of local, national and international programming infused with quality PBS shows. For over 30 years, Channel 12.1 has inspired, educated and entertained with the best in children’s, music, documentary, health, global and public affairs programming. From 4am – 4pm, Channel 12.2 spotlights the best of PBS in children’s programming, music, travel, exercise, cooking, public affairs and more. From 4pm – 4am, Channel 12.2 features FNX (First Nations Experience) – documentaries, dramatic series and arts programming that reflect the lives and cultures of Native American and indigenous people around the world. This channel features MHz WORLDVIEW – a lineup of programs from around the world that provide diverse cultural perspectives for a globally-minded audience. Programming includes world news, foreign affairs, international mysteries, world music, and foreign films. NHK WORLD TV is a 24/7 public network featuring original television programming from NHK (Japan Broadcasting Corporation). NHK WORLD TV delivers a unique and diverse blend of programming featuring hourly live international news from Tokyo and news bureaus around the globe as well as programs about Japanese society, politics, scientific advancement, culture, history, food and lifestyle. 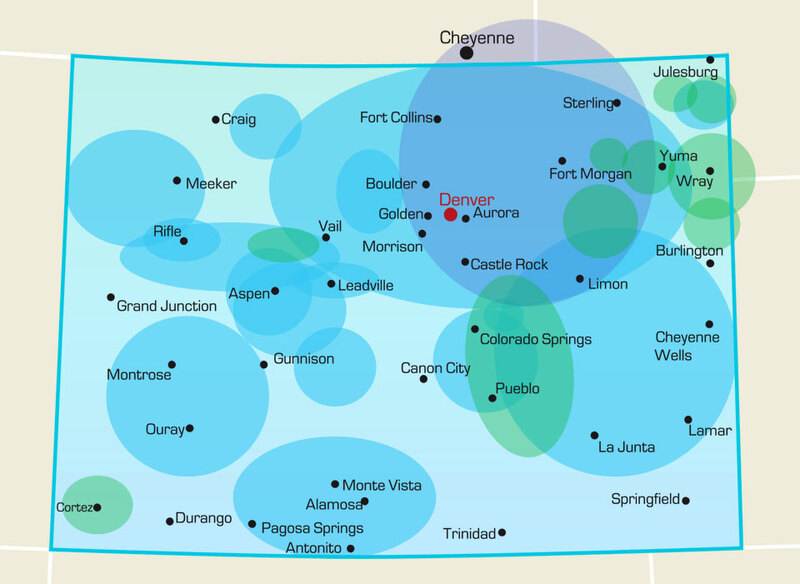 Colorado Public Television serves 85 percent of the state’s population. Transmitter improvements and carriage on cable and satellite systems are extending the station’s reach in almost every direction. Visit our Signal Tips & FAQs page for some pointers from the CPT12 engineers on receiving our channels over the air – as well as some frequently asked questions about our signal.